Art classes with professional painter Dr Gillian Rhys suitable for everyone. Dr Gill demonstrates painting techniques to guide you through making an original artwork while you enjoy your favourite drop (BYO) or enjoy your choice of teas and coffees, nibbles and non-alcoholic drinks (included). All materials also included. Ticket includes all art materials and light refreshments. Bring along your favourite alcoholic drop if you wish. Tickets not available at the door. Paint and Sip classes are suited to painters of all levels of experience. Each week we have a new project and your experienced tutor, Dr Gillian Rhys (PhD visual arts) demonstrates painting and drawing techniques. Beginners find this a lot of fun as it makes the art making process easier to grasp. More experienced artists pick up new ideas and techniques and enjoy a relaxed afternoon of painting. Sunday 5th May 2pm to 5pm 2019 – For our first session we will make the ever popular Gyotaku Fish Print (shown here). We take a print directly from fish on to rice paper and hand colour with charcoal and watercolours. Always a great class. Sunday 12th May 2pm to 5pm 2019 – Discover how preparing your watercolour paper with gold paint and coloured washes makes painting this vibrant duck feather easy and effective. Much easier than it looks! Sunday 19th May 2pm to 5pm 2019 – Using charcoal and wash and a little acrylic paint on prepared watercolour paper the lovely Banksia flower comes alive. Flowering in Autumn they make perfect subject matter for painting and sipping. 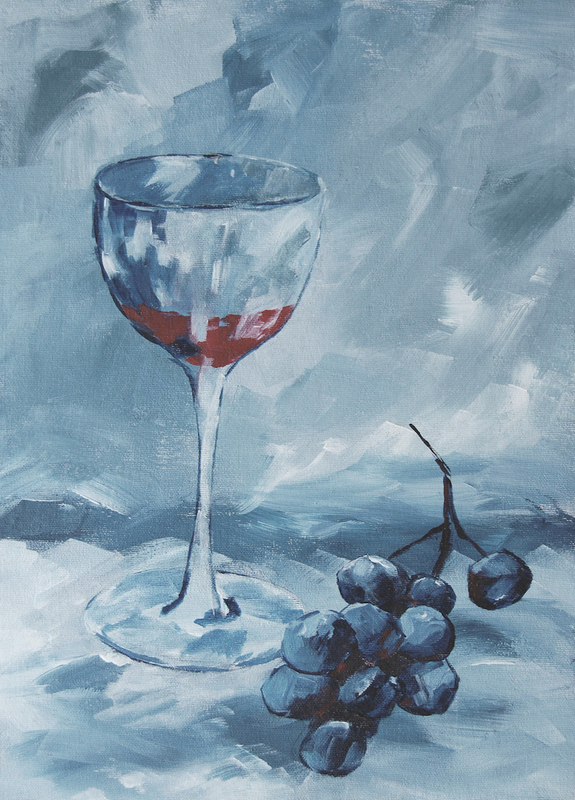 Sunday 26th May2pm to 5pm 2019 – We will use acrylics on canvas to paint this vibrant image of wine glass and grapes. We get to really enjoy pushing the paint around creating this painterly image.